The Canadian Office and Professional Employees Union Local 343 has a long history of representing its membership through collective bargaining, grievances, arbitrations and other legal proceedings. Stirred by the growth of the Labour movement in the 1920’s, office employees, many of whom worked for other Labour Unions, struggled to form a Union dedicated to the representation of office, clerical, technical and professional employees. Local 343 obtained its Charter in September 1956 to the Office and Professional Employees International Union (OPEIU). On June 20, 2004, Canadian members voted to separate from OPEIU and to form the Canadian Office and Professional Employees Union (COPE). This crucial move led to the establishment of a vibrant, dynamic Canadian Union, which had been in operation as part of an International Union for nearly 50 years prior to the restructuring. COPE Local 343 consists of 1600+ members and 93 collective agreements across Canada. Local 343 is an autonomous Local and the largest COPE Local in Ontario. 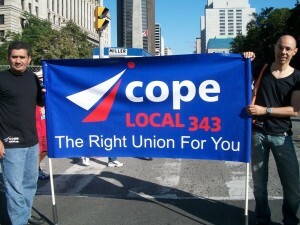 As such, Local 343 has two seats on the Executive Board of COPE Ontario – the servicing body for COPE Locals in Ontario. Our Local’s structure is democratic and allows Local 343 members to have a voice through participation in our Annual General meetings and Convention – the latter being held every two years with an AGM during the non-Convention year. Bargaining Units within Local 343 are empowered to elect their representatives to participate in the Annual General Meetings and Convention. Local 343 is committed to equity, human rights and social justice, and, believes in engaging, educating and empowering the members. At the Local’s AGMs and Conventions, there is always educational, equity, human rights and social justice components. The Local also has dynamic progressive policies and procedures in place with regards to the accessibility of our Local and its events, and, supporting members educational as well as human rights and social justice pursuits. Lastly, the Local practices its commitment to equity structurally as the ten member Executive Board of the Local has two seats for members from Equity seeking groups (Racialized, LGBTQ, and, Disabled) and one for Young Workers.